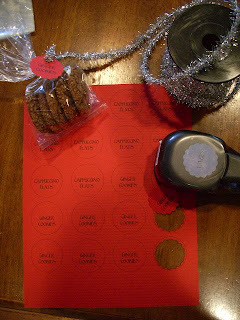 Each year at Christmas time the LOML (Love Of My Life) bakes up several varieties of yummy cookies for our neighbors. He puts a LOT of work into these babies. He scours the internet for new and different recipes and no recipe is too time consuming or difficult for him. I always encourage him to keep it simple, but he's all about the taste, no matter the effort. Then, after all his efforts, he's perfectly fine with putting his creations on a cheap paper plate and covering them with ugly plastic wrap for delivery to the neighbors. He's been doing this for 15+ years and each year I suggest he kick up his presentation a notch or two. He's never interested. This year I figured, if it was important to me, then I should do something about it. So I did. Here's what we co-created together. 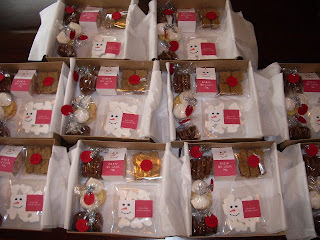 He was responsible for the cookies and I was responsible for the marshmallows and the packaging. 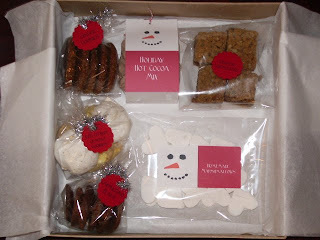 A package of wrapped cookies and the supplies I used to make the cookie tags. 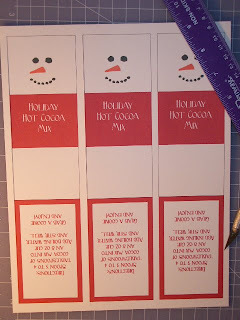 Here's the Hot Cocoa packaging before I cut them out. Props to LollyChops for coming up with the great hot cocoa packaging idea. The filled boxes before they get all wrapped up! 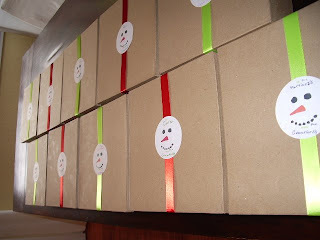 All wrapped and ready for delivery! I like how they turned out and they were worth the hours and hours of work! OMG! This is Mrtha worthy goodness! These are GORGEOUS!!!!!! What a great idea, I wish you were my neighbor!